He was recalled to service in 1914 and kept an office in Little Tew, keeping in touch with the War Office by motor cycles during the night. In 1915 he was appointed, in London, as Assistant Director to Remounts. This appointment remained till the end of the war. 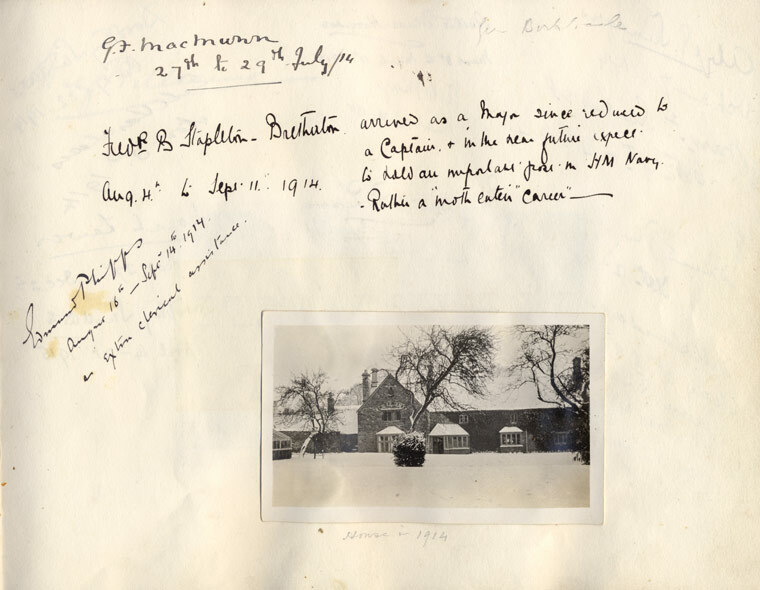 Page from the Little Tew Visitors Book (photograph taken in the first winter the family were in the house, 1913 – 1914. The entrance to the house has been changed but the apple trees are still there). Entries for July 1914, these were all officers in the remounts. Stapleton Bretherton describes how he "arrived as Major, since reduced to a Captain and in the near future expects to hold an important commission in His Majesty's Navy. Rather a moth eaten career." Edmund Phipps, Col Sandars' brother-in-law, had a job in London in the Ministry of Education but between August 15th and September 14th 1914 he was an extra clerical assistant. The office was in the cottages across the road from the house. 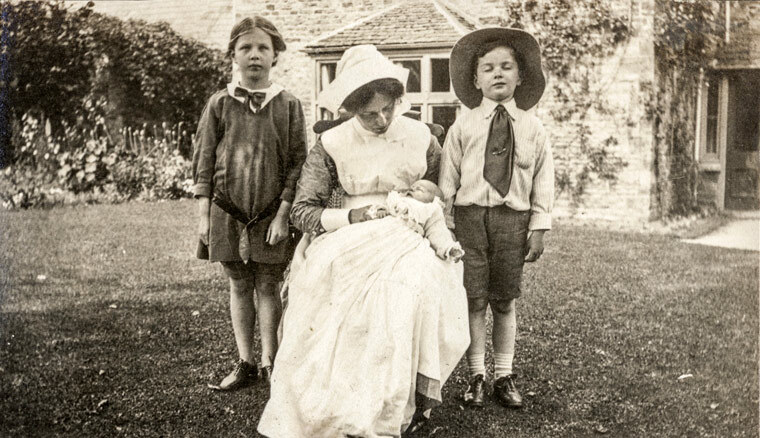 Nancy with her brother and sister, Betty and Hugh, taken in the garden at Little Tew at the time of her Christening, September 1914. In 1916 her father was promoted again to Brevet Lieutenant Colonel and in 1918 the camp at Romsey was enlarged for the demobilisation. It was a difficult time and because my father was very good at dealing with disciplinary problems he was moved to Romsey, one of the demobilisation camps. 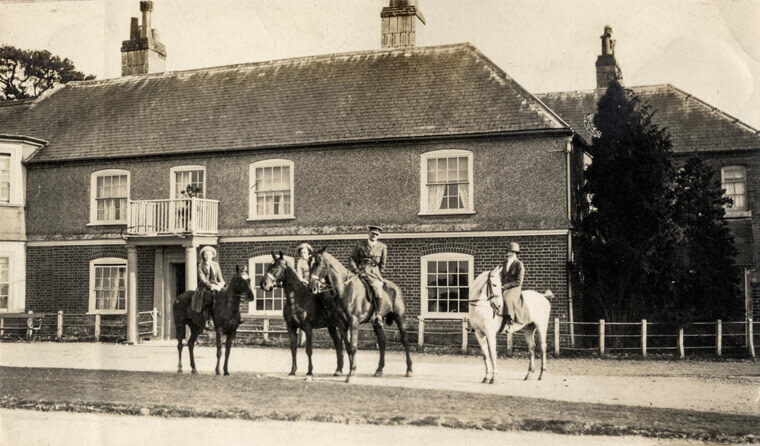 The family joined my father in Romsey and we stayed there till August 1919. 1918, Col Sandars (right) has been made Commandant of the Demobilisation Camp at Romsey. 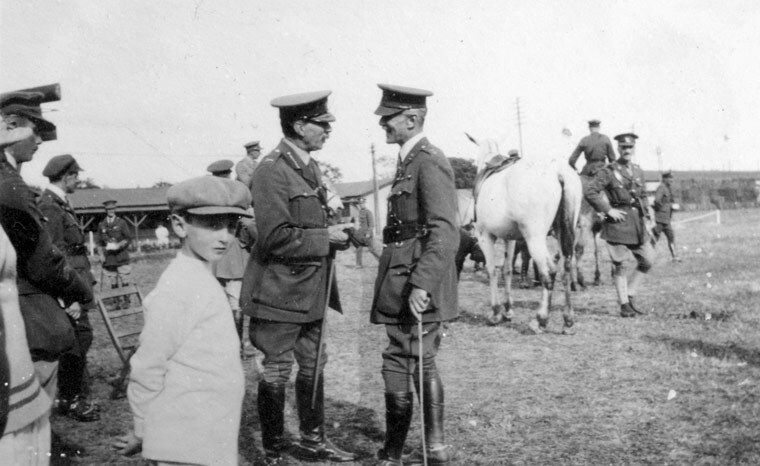 A meet at Romsey, Col. Sandars in uniform. There was very good hunting at Romsey which both Nancy's parents enjoyed. 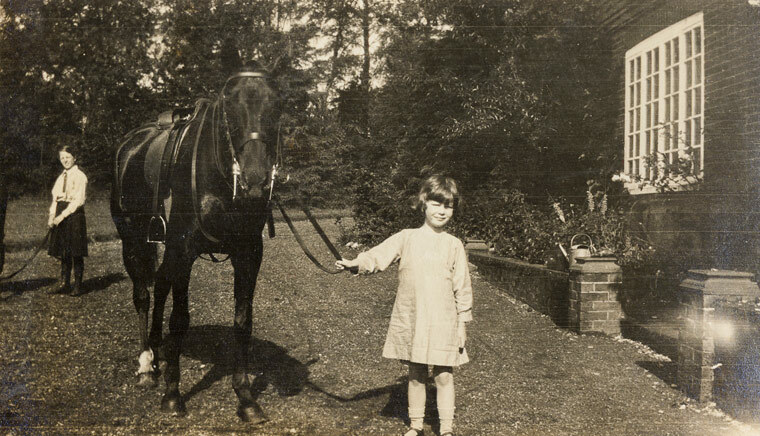 Romsey had quite a number of demobilised horses which were used as polo ponies after the war. 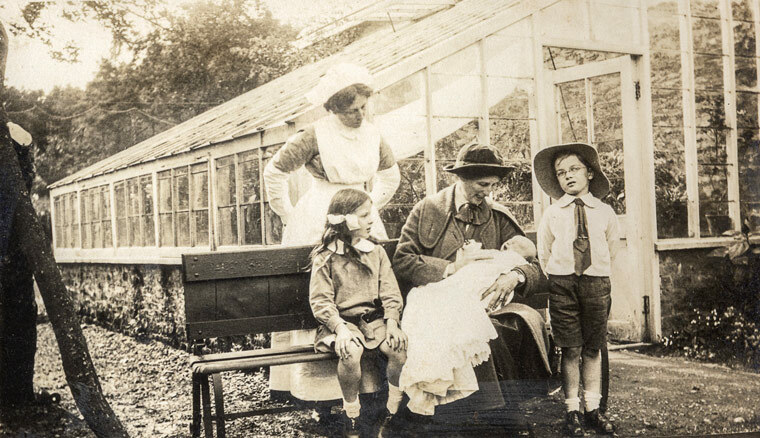 The family went first to a house at Cadnam to the West of Romsey. Betty did lessons with the Chichester family who lived at Embley Park. Col Sandars rode every day to the camp and he took Betty with him and dropped her off at the Chichester's house. There was a gap in the fence and Nancy could see them go past from her nursery window. In June 1919, the family moved to Awbridge near Romsey where Mrs Sandars' VAD friends often came to stay. 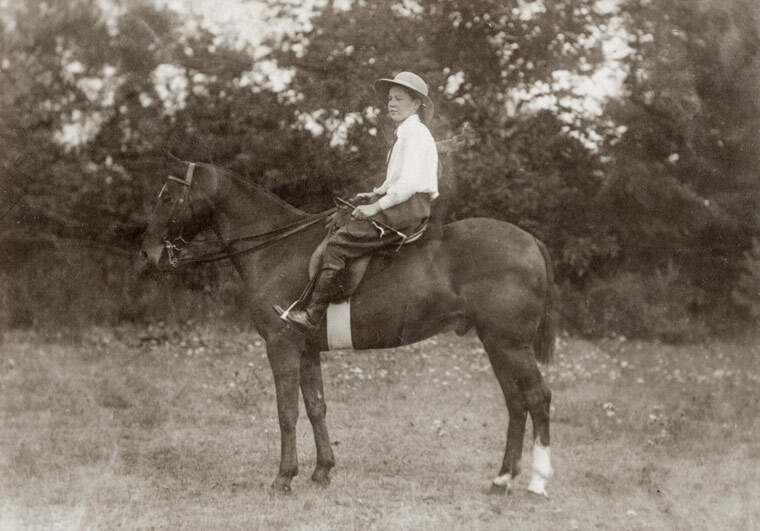 Having moved from Cadnam to Awbridge, 1915, Mrs Sandars on a polo pony which she hunted in the winter. 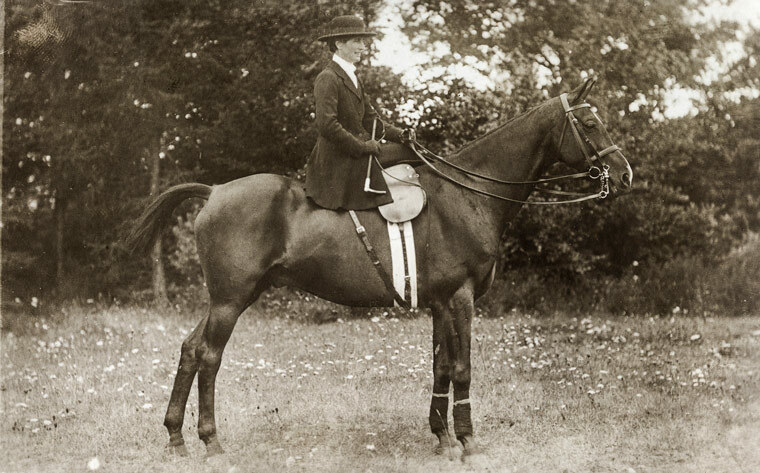 Romsey had quite a number of demobilised horses which were used as polo ponies after the war. 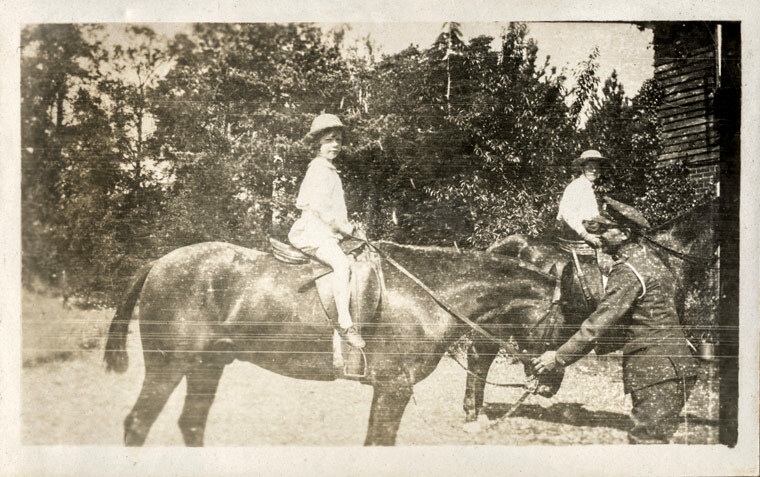 Betty and Nancy, helped by an army groom in uniform, the horses were called Paul and Little Man, both remounts. Nancy leading and Betty in the background. Nancy riding with confidence, although there is a helping hand not too far away! 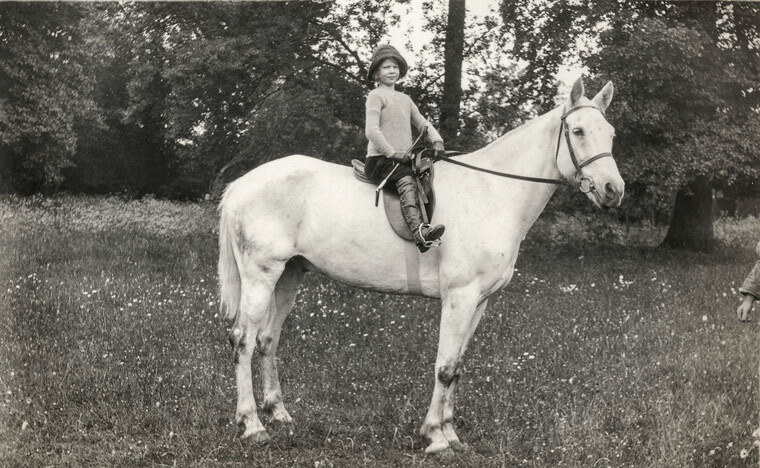 Betty rides a polo pony. Darling Imp'. 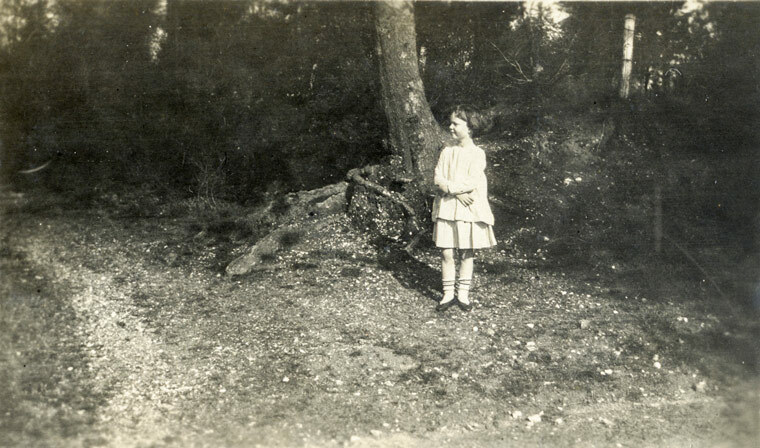 The family move to Awbridge was around the time of Nancy's 5th birthday, July 1919. She remembers going on a wagonette for a picnic for her birthday. Bored of unpacking she wandered off across the road to a very big wood with inviting paths which looked as though they needed to be explored.She took one of the paths and it was a while later that her mother and nurse realised she was missing. Mrs Sandars wrote the following poem of the event. Oh darling Imp what will you do when you are grown a woman too? and cuckoo answers, that is all - ! "Oh God, my friend, please make them come." Lives in the wood where children play. God keep you gallant through it all. Col. Sandars (right) resumed his appointment as Remount officer in the Southern command from 1919 until 1924. In 1919 the Family moved back to Little Tew. 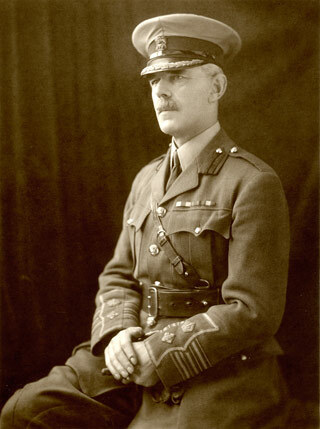 There is a book The Horse and the War by Sidney Galtrey, with a note by Sir Douglas Haig and with many illustrations and photographs appearing under the name of Captain Lionel Edwards, which recounts these times.